On October 6, we will be celebrating the second edition of MAPFRE Volunteering Day. Following the success of the previous edition in which more than 1,300 volunteers planted around 1,530 trees and collected more than 7 tons of garbage, this year we are carrying on with the same slogan “All Together for the Environment”. This event dedicated to caring for the environment now features 51 activities across 26 countries. 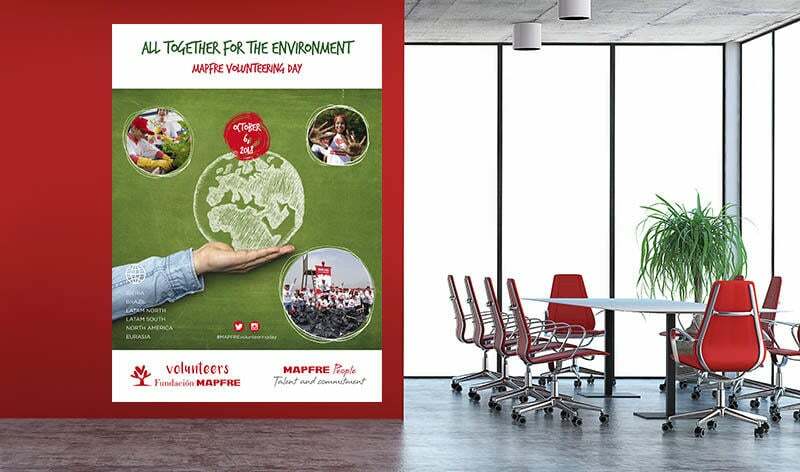 A diverse range of initiatives will be carried out that will all share the common theme of raising awareness of the importance of caring for the environment and coming together, as a global team, to experience Corporate Volunteering at MAPFRE. In Spain, many different actions will be carried out across the country. In Madrid, for instance, “green bombs” (balls of mud with seeds inside) will be launched to reforest the area of the Sierra de Guadarrama mountains, and talks will be given on forest orienteering and footprint interpretation, among other activities. In other countries such as Argentina, for example, MAPFRE volunteers will have the opportunity to take part by planting trees and helping with garden maintenance at a center for the elderly. Meanwhile, in Mexico, eight cities will be involved in cleaning activities on beaches, parks, rivers, etc. In the Philippines, we are also running various activities in schools to promote caring for the environment, among many others. The MAPFRE Corporate Volunteering program is carried out through Fundación MAPFRE’s VOLUNTARIOS Program. For the company, corporate volunteering is in line with the group’s strategy and with its employees’ commitment and vocation for service.